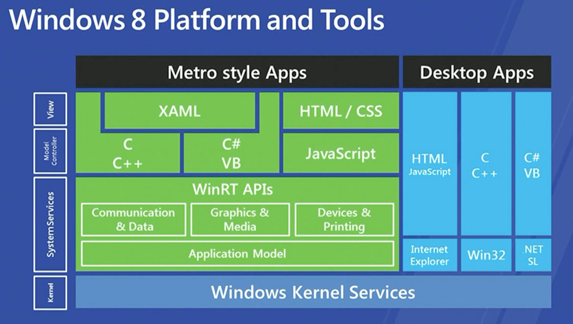 Microsoft at its spirit – really trying to support everything and everyone – the slide is actually oversimplified, but the Desktop Apps part seems to encompass and indicate support for all the legacy apps, languages and APIs, while Metro style (or Immersive) Apps support the same languages on top of a new set of APIs. Whichever language you used before – you can still use it to create desktop or web applications as well as the new Metro style apps. The APIs are different, but seem to be highly influenced by the .NET technologies. Timeline: the blocks should be placed fairly chronologically top to bottom. Dates: were picked arbitrarily from Wikipedia based on dates of initial public appearance or if available – on release dates of the APIs/frameworks/host environments. Light blue (aqua) blocks represent languages, with the shaded ones being the languages available for use with WinRT. Purple blocks represent Windows API and frameworks that wrap its UI components. Dark blue blocks show DirectX, DX-based WPF and WPF derived Silverlight (desktop and mobile). Arrows indicate successors (eg. 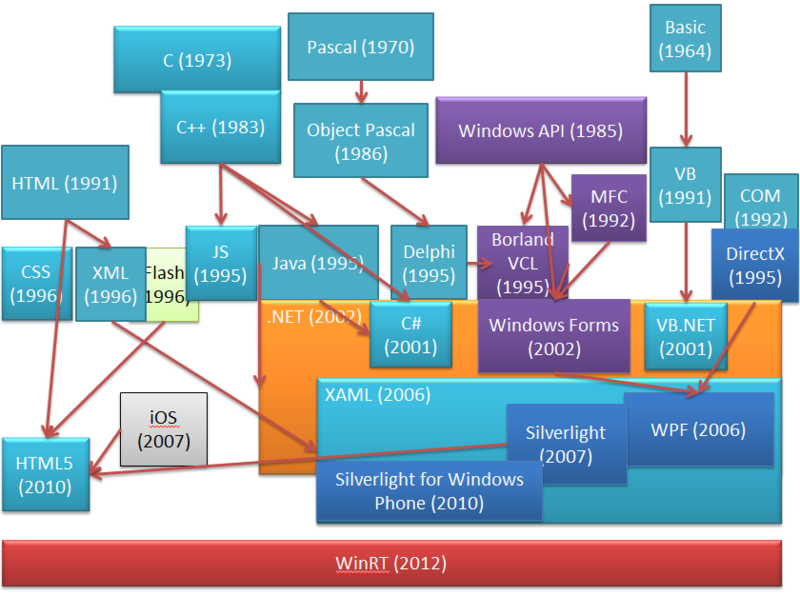 Winforms –> WPF), dependencies (eg. DX –> WPF) or influences successors (eg. VCL –> WinForms).